For Ms. Grieselding, becoming a veterinary technician was a lifelong dream. “I've always cared passionately about animals ever since I was young,” she says. “I always knew I would end up working in a veterinary clinic, either as a vet tech or veterinarian.” She enrolled in our veterinary technician at Maumee campus, thankful to find instructors and fellow students who shared the same dream as her. “Dr. Cole inspired me a lot while I was going through the vet tech program here. Her passion for animals and teaching made me want to show up to class and learn about things that I am also very passionate about as well,” says Ms. Grieselding. However, everything did not go as smoothly as planned for Ms. Grieselding. “A very significant challenge I had to overcome while pursuing my degree was losing my dad,” she recalls. “However, I knew I had to finish for him, so I stayed strong throughout the rest of my vet tech program.” Despite this tragedy, Ms. Grieselding kept on working to fulfill her dream. She completed her externship at Reynolds Road Animal Hospital in Toledo, Ohio and graduated from Stautzenberger College in December of 2018. Today, she is living out her dream working at Total Pet Care. We hope Ms. Grieselding's story inspired you. 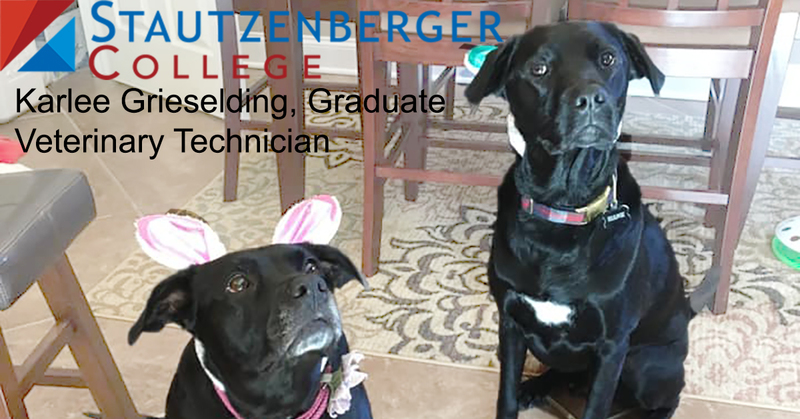 Whether you are interested in the veterinary technician program or one of the many other programs offered at Stautzenberger College, please come in and talk to us today to find your career passion. Call 888.859.8225 or submit our Request Information form to learn more.